you know what? it's pumpkin season and it cannot be helped. for some dang pumpkin chocolate chip cookies. when i was in high school there was this girl i went to seminary with named rachel stratford. and always had fresh tuna fish sandwiches and a pumpkin chocolate chip cookie in her lunch. so i bought rachel. primarily so i could force her to bring me lunch for a day. and i am telling you what, it was worth it. this recipe isn't exactly it, but it was still good. mix wet ingredients till creamy, add dry until thoroughly mixed. bake for 12 minutes if you make moooonster cookies like i do. otherwise 9 minutes oughta do ya. it's worth it to wait until they've cooled. they're great warm but much better at room temperature. 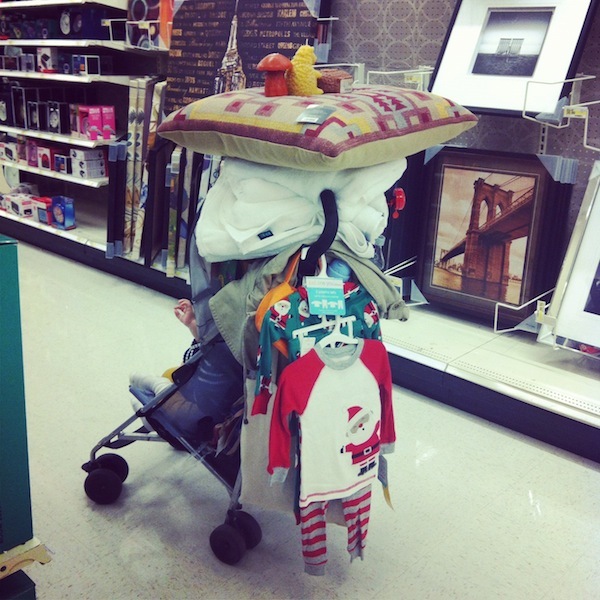 then i can most likely get it all home on the stroller. for posterity. i mean, look at this. jersey sheets, four towels, christmas jams. assorted kitchen items. the elevators were out at my stop! and carried it up two flights of stairs. so i mean what else is a blog for if not for bragging about pointless stuff like that. I am in Southeast Idaho so I do not know about going up 2 flights of stairs with all that, but I do understand not putting things that can be ripped open with small teeth near your toddler. At Target today my son (2.5 years) ripped open a DVD. That I did not pick out. That I probably would not have bought. So I should just keep them in a stroller and pile high like you. Then it can't be reached! There's a new Target in the Bronx? I know about the one at 149th not far from Yankee Stadium in that huge shopping complex. I used to live nearby and it was the worst! Hope indeed there is a new one; those long lines, poor customer service and of stock shelves were awful. ok so, um, a little awkward but I happen to have a girl crush on you...but one question- what is it with americans and pumpkins?? we eat them year round in aus, and ok we don't really "do" halloween, but why do you get pumpkin in a can? wouldn't you want it fresh if it is in season?? 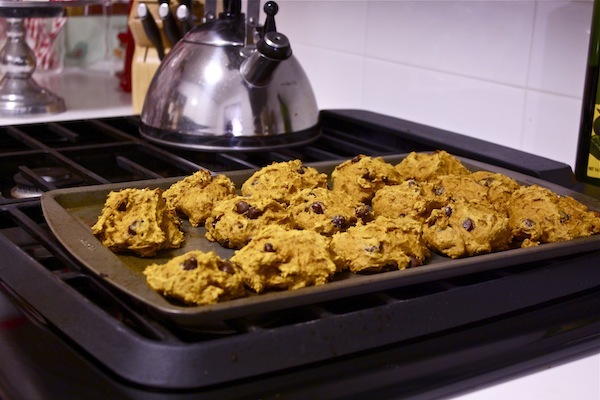 seriously the BEST pumpkin chocolate chip cookies have three ingredients. 1. Spice cake mix. 2. Pumpkin (canned is easiest). 3. chocolate chips. Mix and throw in the oven for 10 minutes and THE BEST. seriously natalie. This is the recipe we use, and I agree, delicious. So try it! Also sometimes my step mother makes glazes for it, like brown sugar, or orange, things like that. Carrying all that up two flights of stairs?? Bravo! so you and i are kindred spirits i think. mostly because of the pumpkin choco chip cookie thing. except i live in the northern tundra (aka minnesota) and am sans one huck-child of my own. but kindred spirits! 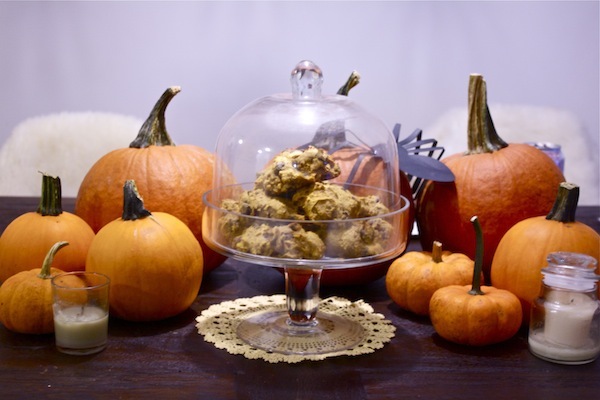 Oooh I've been wanting to make my moms pumpkin chocolate chip cookies! They are to die for delicious! Stay posted on my blog cuz ill be doing a post on them soon! I live in Scotland and we walk everywhere too. I've almost squished my toddler's head because of laying a big mirror on the top of his stroller. Oops! We don't have pumpkin here. I mean the veg is hard to find anyway but the canned pureed veg is even harder. I found 2 cans for $15. Dented. I bought them. I'm waiting to make me some pumpkin choc chip cookies until next week. I'm craving them SO bad. Love these short little stories - go you! couldn't imagine dragging all that up all those stairs! I have had great success with this recipe! It is one of the only things I've made and had requests for the recipe. Also, if you make them, I'll live vicariously through you, because I am in Sweden now, and they certainly don't have canned pumpkin, but they really certainly certainly do not have canned pumpkin pie filling. mix and spoon onto cookie sheet. bake at 350 F for 10 to 15 minutes. I would probably be skinnier if I lived in NYC, given how much I love Target. One time I strapped six packages of Trader Joes candy strawberries to my body in order to make it through the airport lines from Boston to DFW. Then about a month after my trip they opened their first TJ's in Texas. That was fun. I started reading your blog about two months ago. Really enjoying your everyday adventures around NYC and your honest writing. My little one and I are fascinated with everything New York- him mostly king kong on top of the Empire State Building, so it's fun to see a mommy and her little one around the city. Thanks. Very impressed!! Those jams are the CUTEST! what a great rule! I love those jams. I love Christmas in general right now. I am always amazed at the power Target has to turn a few $3 purchases into a $100 total. I like this rule though. If you can't walk it home is it really something you need? I'd always say yes though. 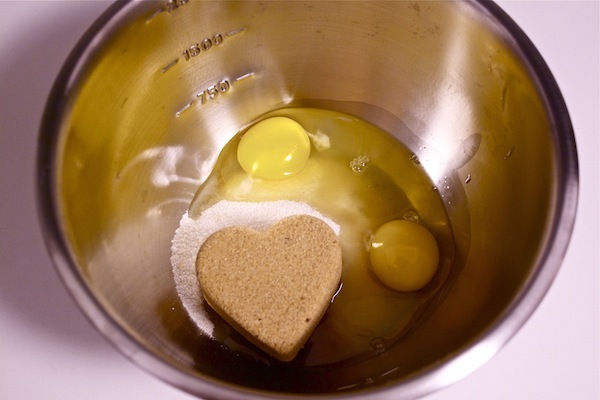 Why is your brown sugar heart-shaped? I have never seen more adorable brown sugar in my life. Is it a heart-shaped measuring cup? Oh, good golly, girl. I would definitely be missing the trunk of my car about then. Betina makes the best pumpkin chocolate chippers I have ever had. Totally worth emailing her be ause I can't remember the recipe off hand. I love how Huck's hands and feet are visible in that stroller shot, and not much else! I don't know if this is 'the' recipe you were referring to, but, the easiest and quickest ones to do is chocolate chips, a box of spice cake, and a can of pumpkin. AND THAT'S ALL THERE IS. They're pretty good. 350* for 15 mins, I believe. Yums, I'm definitely making some pumpkin choc chip cookies soon! 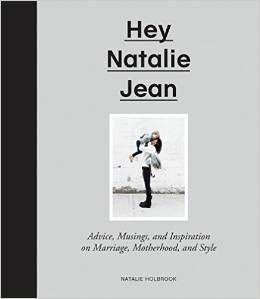 And Bravo, Natalie! I am very very impressed by your balancing and carrying skills! And that little hedgehog candle is the cutest. I was eyeing it last time I was at the Target, as well! This recipe is amazing at high altitude, so I'm not sure it will work for you, but they are so so so good (if you like a cakey cookie)! Soft and delicious! The other night us ladies had a pumpkin night at church. I brought pumpkin pie soda! Some one else brought pumpkin butterscotch cookies - Delicious! Pumpkin chocolate chips are my favorite! Can't wait to try the recipe! mix the first 4 ingredients. add the rest and mix. place large tablespoons on a greased cookie sheet. bake at 375 for 10-12 minutes. Check your Facebook wall . . . I recently made some excellent pumpkin muffins (but they could just have easily been cookies) using a yellow cake mix, can of pumpkin, some cinnamon, and about a cup of chocolate chips. So easy and so yummy! I recently moved to NYC and I totally relate to the shopping thing. My shopping habits have had a rude awakening. A great recipe I can't wait to try out. It looks incredible. I love Pumpkin and those adventurous enough to use it! I wish more would. I came up with my own version of a Pumpkin Chocolate Chip Cooks. While different from your own, I think mine is a unique take on the dish. I'm new to the Food Blog scene and would love some feedback from a pro like you. Check out my recipe if have time.